"Alone/Together" Antoinette Jadaone couldn't be happier that she worked with Liza Soberano and Enrique Gil. 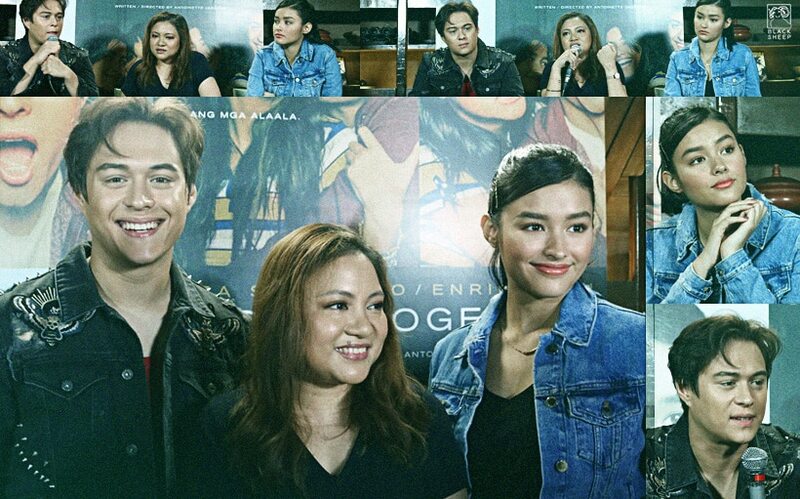 The director was all praise for the talented love team at the "Alone/Together" meet-up with members of the press earlier today, January 30. She was particularly impressed, she said, in LizQuen's obvious intellect as they collaborated to create Christine and Raf, their characters in the much-anticipated film. She revealed, "They are very young, pero they are very smart actors. Really smart. Alam mo na nag-iisip silang actors, for people na ganoon kabata [to] play their roles five years apart ang age, nakakabilib na kaya nilang mag-shift [so quickly]." She continued, "At saka very versatile 'yung mga mukha nila, eh, kaya nilang mag-play ng bata, very innocent and very idealistic to tumanda na. Gift din nila 'yung mga mukha nilang kaya naming pabatain o patandain kung kailan namin gusto." According to Liza and Enrique, Direk Tonet gave them enough leeway to be able to really explore and build the arc of their characters. The film will follow two people's love story from its beginning in university all the way to the "real world". "Na-challenge din ako," Enrique said, "It gave me a sense of freedom as an actor, but I couldn't do this without Direk." This collaborative relationship was the result of Direk Tonet's complete trust in LizQuen as actors. "I think 'yung freedom for them to do what they want for their characters and the scenes, it's not mostly freedom, it's my trust for them. Kasi nakita ko na kilala na nila 'yung characters nila, so I'm just the director and the writer and I trust them...to know more about the characters than I do," she said. Produced by ABS-CBN Films' Black Sheep, "Alone/Together" will hit cinemas nationwide this February 13. It will mark Liza and Enrique's return to the big screen after Cathy Garcia-Molina's blockbuster hit "My Ex and Whys" which was released back in February 2017. ‘ALONE/TOGETHER’: Bagong pelikula ng LizQuen, may title na! LizQuen to share first on-screen kiss in ‘Alone/Together’?